Description: Chair yoga is a gentle and supportive way to experience all the benefits of yoga for the mind, body and spirit. The use of a chair makes yoga accessible to everyone. While seated, the chair provides support for the body through all types of yoga postures such as; twists, hip stretches, forward bends, range of motion movement, and back bends. While standing the chair can be used during balance postures and gentle standing movements. 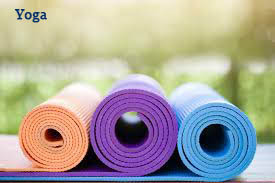 Enjoy all the benefits of yoga including improved strength and flexibility, stress reduction, breath awareness and an overall sense of well being.This class is open to all students of all levels and is accessible for those with limited mobility, chronic pain, are new to yoga, or who might have a limited ability to stand. This safe and gentle class will create a therapeutic foundation for everyone who wishes to practice yoga. Class is limited to 6 students to allow for personal attention for all students. Please call to reserve your space for the class. Description: Vinyasa Flow is yoga movement synchronized with the breath. Class begins with relaxing the nervous system and then slowly building breath with movement. Yoga postures are linked together and create a flowing meditation. Vinyasa builds strength and mental focus while allowing the body to release tension. This strong practice ends with relaxation and meditation to restore the body and connect with inner clarity. Create a strong foundation and find peace in this dynamic form of yoga. Class is limited to 6 students to allow for personal attention for all students. Please call to reserve your space in the class. Description: Unlike most yoga classes the main focus of this class is not the fitness of your body. In this class we will be more focused on working towards emotional wellness. This class is designed specifically for those who would like to know how to use the principles of yoga to facilitate a healthier emotional state. Each class will consist of a breathing exercise, guided meditation, and movements and stretches which facilitate emotional health. Often, at the end of the class the student will have a take home sheet with the class activities to practice for the week. Class is limited to 6 students to allow for personal attention for all students. Please call ahead to 841-4307 to reserve your space in a class. Please wear loose fitting comfortable clothes. You may bring your own if you prefer. Please call The Center and ask to speak with Molly or Heather. You may also send us an email in the contact section of this site.